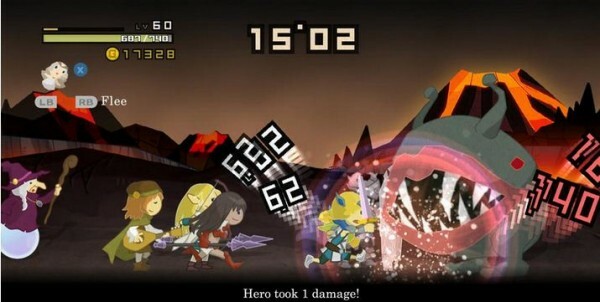 Combat is reduced to its essence: creature is encountered, hero rushes forward, swing, swing, swing, bash, bash, bash, either the monster is defeated or the hero is and the hero is then reset to the beginning of the map while the timer continues its race to the world-ending 0:00. The hero completes a quest here and there, gains equipment, battles evil lord, and then on to the next 30 second disaster scenario. Journey go lightly – This is not a game that takes itself seriously. The tongue-in-cheek nod toward the conventions of Japanese RPGs, the cheeky nature of the Time Goddess, the complete disregard for providing a reason why a) so many evil lords exist, and b) why they want to destroy the world, and the oddly banal names for most equipment; these all add to the impression of the game as a semi-frivolous romp. Add to that mix some often (but not always) funny writing, and you’ve got yourself some very humorous gaming fare. The timer of doom – Whatever you call it, the timer that counts down to the world’s end sits atop the screen, nice and large and flashy. As the timer nears zero, the screen changes colors, the world darkens, and it becomes abundantly clear that the end is nigh. This Sword of Damocles convention really works, and saves the game from being completely frivolous, because no matter how lightly the game takes itself, players cannot forget that they are only seconds away from losing. This adds a sense of urgency, of motivation, and of tension – and that really pays off. The graphical throwback – No distillation of classic Japanese RPG would be complete without some retro graphics and musical flair, and on the graphic front this game delivers in spades. Players may not always enjoy the 16 bit (or 8 bit) graphics, but anyone who remembers the early days of Final Fantasy will no doubt recognize their past in the woods, grass, and stone of Half-Minute Hero. Nostalgia can be quite the aphrodisiac for gamers, especially for those of us who are either old enough to remember or young enough to think it’s cool to be retro. Repetition – Despite spelling’s suggestion to the contrary, fun is not always part of funny. The game is humorous, yes, but that doesn’t always mean the actual gameplay provides any emotional satisfaction. 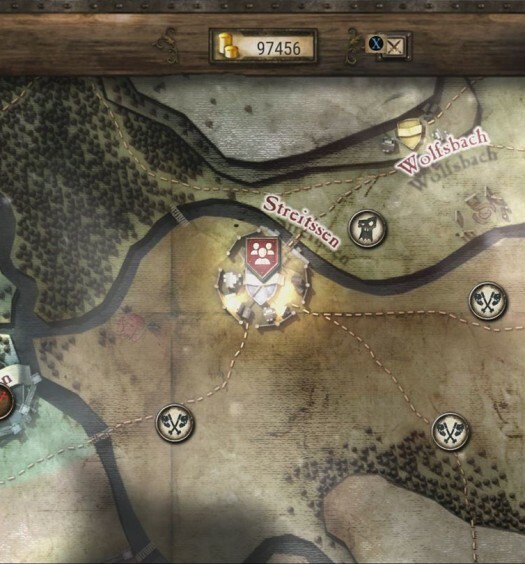 Many players will find the game’s half-minute timer to be a fun and frantic innovation – for the first few quests. By the time the questing hits the mid-teens (the half-way point of the Hero 30 gametype), they might find the game becoming a bit repetitive. Guitar squeals that once spoke to the urgency of the game start to become more than a bit annoying on the ears. The slight variation between evil lords becomes incidental and is quickly ignored, and so on. It will be interesting to see what percentage of Half-Minute Hero buyers actually complete the Hero 30 campaign. Grid-based navigation – A 30 second timer does a fantastic job of supplying plenty of urgency. The navigation of the main character, by contrast, supplies plenty of frustration. Moving is way more difficult than it should be, in large part because the hero can only travel in straight, grid-based lines. There are no diagonals, only right angles, and many a timer will count down simply because the game didn’t believe that the player’s choice of zig and zag fit within the navigation parameters. Perhaps this is due to the game’s roots on handhelds; perhaps it’s a purposeful decision to up the difficulty for players – whatever it is, it’s annoying. Losing because one made a poor decision or moved inefficiently is one thing. Losing because the game didn’t think you could move in a particular direction is another. 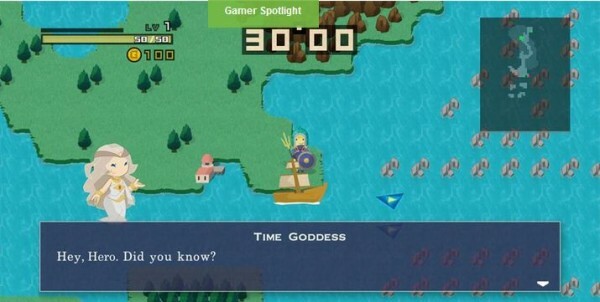 Other game modes – The original Half-Minute Hero included some other game types that had their own semi-dedicated campaigns, and that hinted at a larger story of the world and its development. These other modes are still there, but they’re almost like random extras, rather than core parts of the game. That’s a shame, because the Hero 30 campaign could have benefited from more sustained variety from elsewhere in the game. At the end of the day, some players are going to love this game, and other players are going to think the whole thing an annoying exercise in wasting Microsoft Points. We liked it much more than we disliked it, but we can understand if folks have a different and more negative reaction. Our best suggestion is to give the game demo 30 seconds of gameplay time and see what you think. Half-Minute Hero deserves at least a half-minute of your time. Half-Minute Hero is a game that has a lot of fun poking fun at the RPG genre, but in reality takes those tropes and makes something that’s completely fresh. Having to save the world repeatedly from an impending spell of doom under the condition of “get it done as long as it doesn’t take more than 30 seconds” could get monotonous. It doesn’t here. Each quest that Marvelous Entertainment has crafted turns out to be short and sweet with unforeseen depth. 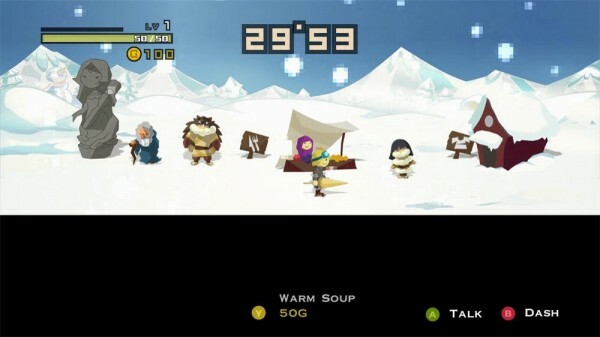 Multiple side objectives, alternate routes, and optional companion characters may reside in each cleverly crafted level. 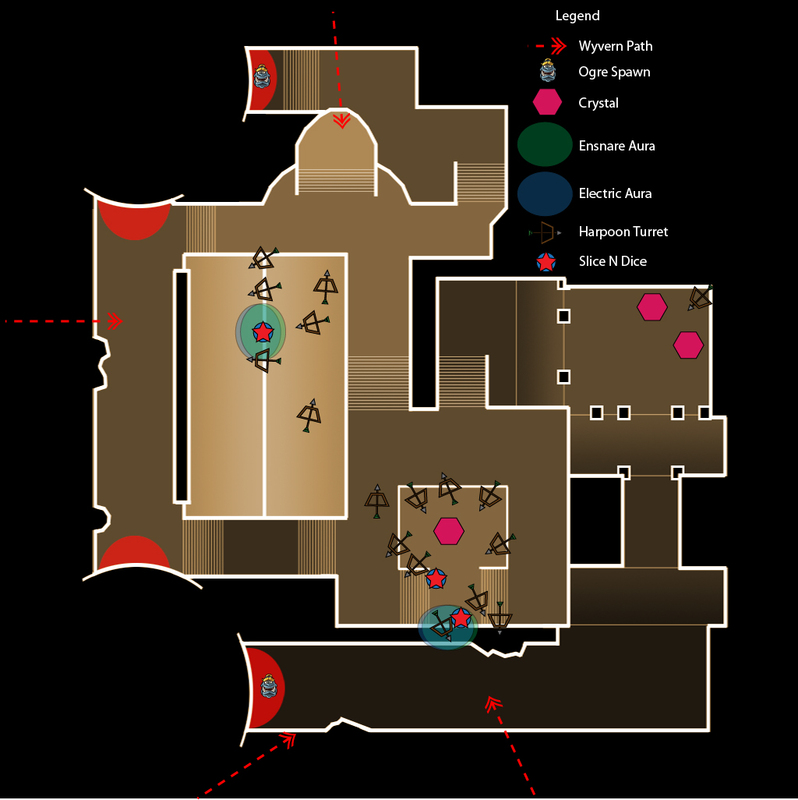 There’s much to do here for completionists after the Hero 30 mode is finished including 5 other modes that carry on the tale. 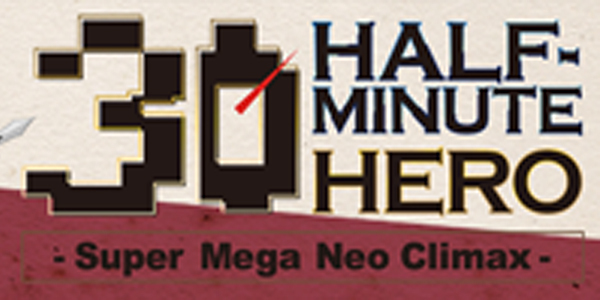 The addiction of the fast paced missions, collecting items, and finding new, genuinely funny characters will keep Half-Minute Hero near the top of your library for some time. 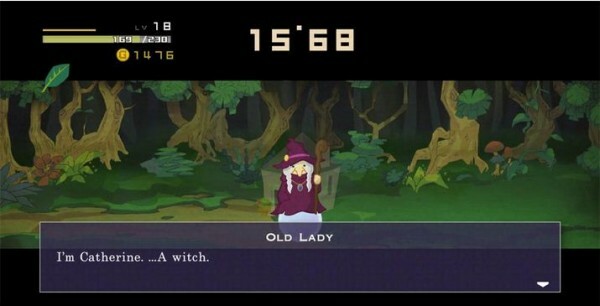 The only downside of the game lies in the “Retro” visual style that originated in the PSP version. On larger displays the pixelated characters end up looking less like recognizable designs and more like a mish-mash of colored blocks. It’s made apparent quickly why the style was ditched in favor of the adorable “NEO Cartoon Mode.” Visual gripes aside, Half-Minute Hero is one of the best RPGs on the 360. It’s fresh, cool, funny, and should be purchased immediately.